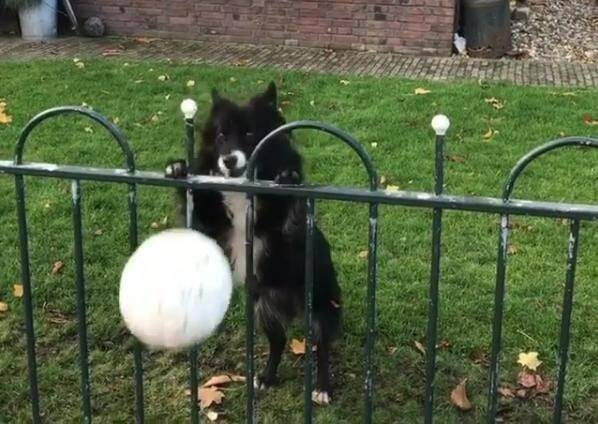 Dog Tricks Passersby into Playing Fetch! Awww! Cute Dog Videos Dog News Entertainment Floof Funny Funny Dog Videos Instagram International Just for Laughs Social Media The Dodo Video Wow! What Sue the dog wants is a never-ending game of fetch. And she figured out exactly how to get one. Smart doggie! Sue is a border collie. She lives in the Netherlands. And like many dogs, she has an Instagram account. Now, border collies are well known for their smarts and Sue is no exception. She’s figured out a super clever way to find fetch partners and it’s pretty simple: she tosses her own ball over the fence and sits, looking sad, pretending she lost it, until someone comes by and tosses it back over so she can chase it! Then back over it goes, either to this new willing playmate who might stay and toss it a few times for her, or the next silly human who gets duped into Sue’s fun little charade. Check out the above video to see how many people get roped into Sue’s world! What’s nice is that Sue never has to wait very long for a new playmate. really nice post. thanks for showing us. I really love Dogs !! Great article.. I Really love Dogs !! I love dog, I have a dog name “Tiger”:. i dont have a dog im sad. i like dog. thanks for sharing. Share it again on your postl. You earlier like will be see on the post.